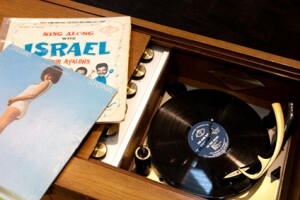 On May 12th, our “Jews on Vinyl” exhibit will be opening up at the Skirball Cultural Center in LA and will remain up through September. We cannot think of a better way to stay cool during the long, hot summer than relaxing in a recreated 1950s living room and listening to some classic Irving Fields gems. To kick off the exhibit, our own Josh Kun and Courtney Holt will be speaking about the music and the Idelsohn Society mission on Tuesday, May 11th at 8:00pm. Click here for more details. And stay tuned for announcements about special listening parties at the museum (June 3rd and July 8th) and our MASSIVE concert for August 19th. Details to come.